This is a copy of Ability Meter's Homepage, hosted on Clearbird's server (Nov. 2003). Check the original AbilityMeters.com for latest updates. The Ability Meter Model 3a takes advantage of state-of-the-art electronics to provide the highest quality available in biofeedback instrumentation using the Galvanic Skin Response (GSR) principle. The Ability Meter is specially designed to assist in one-to-one (two hand-held electrodes) and solo (single hand double-electrode) psycho-therapeutic and personal development procedures. Indeed, there are many situations in which it is extremely helpful to be able to detect the presence of emotionally charged, suppressed mental content just below or at the borders of subconsciousness. This is a tremendous aid in assessing which of many specific topics is most relevant to be treated and at the same time, such material is also accessible and readily viewable by the subject. This can save many hours of wasted searching and discussion and when you have used an Ability Meter for a short time you will wonder how it is possible to be effective in developmental therapies without one! The article 'Biofeedback Monitoring' gives further information on the applications of the Ability Meter. 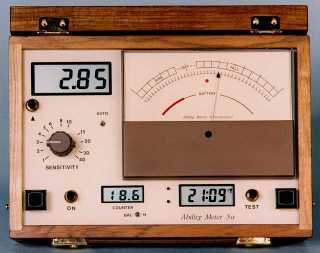 The purpose of this page is to give you product information on the latest version of the Ability Meter Model 3a. More about the Ability Meter 3a - Automatic! There is no Balance knob as the needle is brought to 'Set' by the exclusive auto-rebalancing electronics. This occurs virtually instantaneously because of the Unique Natural Needle Response. Why Unique? Ability Meter needle movements are specially manufactured to our specifications and form the heart of our unrivalled and highly acclaimed Natural Needle Response. The fast movement of the needle instantly and accurately reflects what is actually happening within the mind of the subject with no inertial 'swings' of the needle. Why Natural? This response can only be achieved by using specially manufactured, high quality needle movements. Attempts to artificially simulate the same response by electronic means result in unnatural needle responses which do not fully correspond to what is happening in the client's mind. There are also digital displays of the total count of Balance changes in a session and of the Time. Sensitivity can be adjusted to suit the subject. The use of modern electronics means that the Ability Meter will provide years of reliable operation with no necessity for re-calibration after manufacture, e.g. with changes in ambient temperature. There is a pushbutton switch on each side of the meter so that the needle can be Set using either hand. There is also a remote plug-in switch which can be used as a footswitch. These switches can be operated silently and move the needle to the Set position in a fraction of a second, when the needle has gone off either end of the dial. In this mode the meter detects when the needle has gone off the dial and generates an automatic needle Set. The manual pushbuttons still remain operational. A red indicator lamp in the middle of the dial illuminates whenever a needle Set is activated, eliminating any confusion between a genuine Reading and a meter-generated rebalancing movement. Since the needle is brought to Set rapidly (automatic rebalancing), there is little chance of missing Reads (instant needle responses), which may occur if one has to adjust the Balance manually or if the needle moves right off the dial. The meter demands much less attention from the user, either solo or with a client. For example, when assessing a list, the user can Set the needle at the beginning of the question without even looking at the dial and know that it will be ready to catch the Read which may occur at the end of the question. The ease with which the needle can be Set, particularly using the footswitch or in automatic mode, is a great asset to the solo user of this equipment. New circuitry in the Ability Meter Model 3a overcomes the problem of a drop in sensitivity at high Balance settings. This Ability Meter now runs on only two AA cells, lasting many hundreds of hours. These batteries can easily be replaced without opening the case and there is a low battery indicator in addition to the usual battery indication on the dial. If you forget to turn the meter off - no problem - the meter turns itself off automatically if not used for about 30 minutes. The Needle Movement counter (previously an option) is now included as a standard feature. This facility provides an alternative to the standard method of counting the total of Balance Action (a.k.a. TA) on the basis of the amount of rebalancing required during a session. Due to completely redesigned electronics, the price increase has been kept to a minimum at 525 GBP with absolutely no compromise in the high quality of construction and the components used. "We received the meter. Thank you! We are very impressed. Everything worked properly. It appears to mirror mental/spiritual activity better than any other meter we have owned and we really appreciated your setting the meter to L.A. time." T.P.C., California. "I got to use the meter again on Saturday for about seven hours and I am even more impressed with the performance. The quality and appearance are first rate, the meter even feels good to hold. The automatic balance adjust feature is greatly appreciated as I found it to contribute to smoother, easier, more relaxed sessions." R.A.C., California. "Thank you for the Ability 3a meter that you have sent me. I possess and have used for a long time a Mark 7 and a Super 7; I can affirm, without any doubt, that your Ability 3a is much more precise and more manageable!!! This is also affirmed by my clients. It's really a pleasure to deliver sessions and also to solo with your meter. Many compliments !!!" F.M. "Needle reads much better than on other makes of meter. Here in Moscow one of the leading practitioners of our group has the Ability Meter 3a - very beautiful and efficient meters." O.M. "I received my meter, works great, as described." J.G. "I'm impressed!!!!!!!! It's great to know somebody is working on better instruments to help us enhance awareness and freedom." G.S. "The first meter arrived yesterday. After a short session it became clear that you really have a state of the art meter." C.T., California. "I am using it everyday and it is a superb machine." C.T. "Many thanks for the 3a meter. It is much better than any previous unit we have ever seen or operated. Well done for a really pro job." V.B. "I communicate you that the first (Ability) meter 3a has arrived this morning. It is really splendid!!!!!!! I thank you a lot." F.M. "The meter provides a clean and accurate mirror of all that is going on in the mind. This inspires a relaxed confidence. So much better than any other meter I have used, regardless of cost. The automatic facility works like a dream and the quality of the electronics is superb!" D.H.
or by a direct bank transfer (account details supplied on request). Payment in other currencies is also acceptable. The Ability Meter 3a comes with special fast-warming solo & twin electrodes, batteries and full operating instructions. The footswitch is an optional extra priced at 36 GBP. A Needle Mover (a potentiometer that is very handy as a training aid, to illustrate various needle characteristics) is also an optional extra and priced at 15 GBP. All prices are exclusive of VAT except where specified.